False Coffee Tree is a shrub or small to medium-sized tree up to 25 m tall, bole up to 30 cm in diameter. The leaves are opposite, have stout stalks, and very leathery, oblong or ovate, 15-33 cm in length, 8-18 cm in width, rounded or somewhat heart-shaped at the base, and pointed at the tip. The stipules from a cup around the stem on which the leaves are borne. 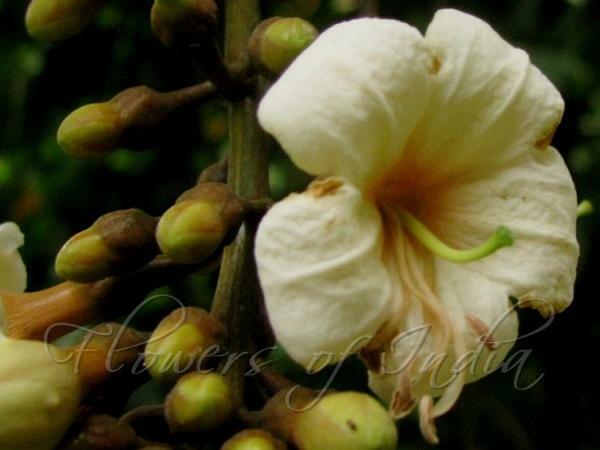 The flowers are borne in clusters on terminal inflorescences which are often 20-30 cm in length. They have a white, funnel-shaped corolla about 2.5 to 3 cm in diameter, with 5 prominent lobes. Fruit is round to ellipsoid-ovoid, apiculate, bluish or greenish or red when ripe, about 1 cm in diameter. Medicinal uses: In the Philippines, the bark and the flowers are used as an antidote for snakebite. A decoction of the roots is frequently given as a tonic after fever, for pains in the loins, and for coughs. A compound decoction of the leaves, with of santol (Sandoricum koetjape), may be drunk as a tonic. The pounded roots are used for poulticing an ulcerated nose. A decoction of the leaves may be used in a medicinal bath for curing fevers in children. Boiled leaves are used for dropsy. Leaves are used as a fomentation for rheumatism. The bark is prescribed as an application for pains connected with miscarriage. The root-bark is used as a febrifuge in India. Photographed at Jirkatang, Andaman & Nicobar.